Looking to buy safety vests in Rochester NY, Ithaca NY, and Western NY at competitive prices & with exceptional service? The Duke Company proudly carries the finest ANSI Class 2 Vest with Pass Through in both High Visibility Green and High Visibility Yellow. Two-tone ANSI class 2 vest. D-Ring pass through which enables unrestricted productivity when you need high visibility gear, but need to wear a safety harness on the job. 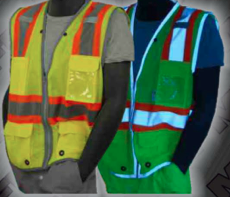 Reflective piping through-out the ANSI Class 2 Vest with Pass Through ensures visibility at night. Four pen pickets with velcro closures. Two waist pickets with velcro closures. Two radio microphone tabs on both the left-hand and right hand side of the chest.